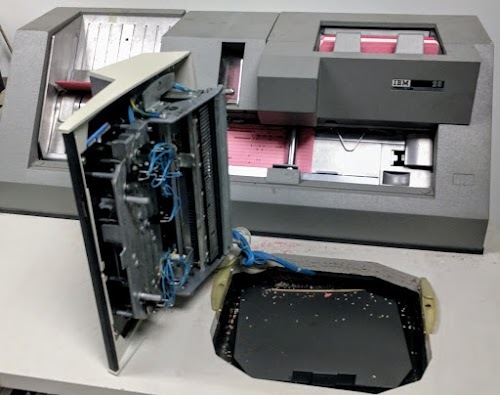 In this article I describe repairing an IBM 029 keypunch that wouldn't punch numbers. Keypunches were a vital component of punch card computing, recording data as holes in an 80-column card. 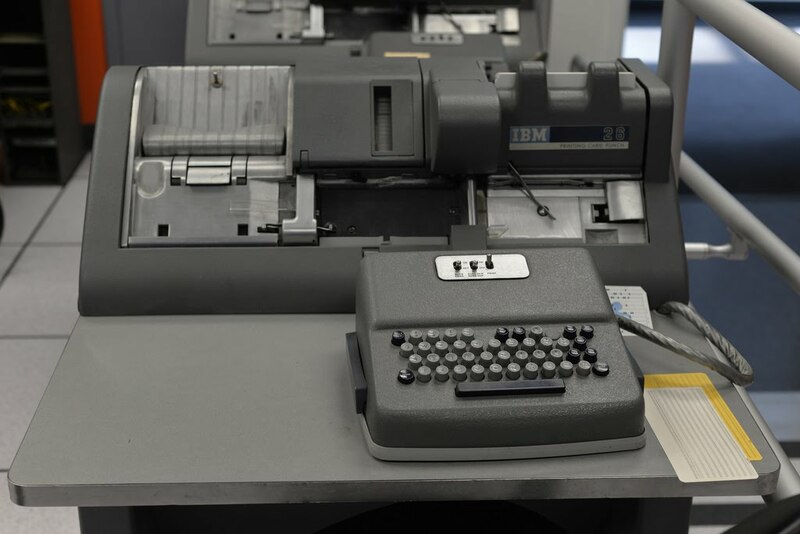 Although keypunches have a long history, dating back to the use of punch cards in the 1890s, the IBM 029 keypunch is slightly more modern, introduced in 1964. The repair turned out to be simple, but in the process I learned about the complex mechanical process keypunches used to encode characters. Keyboard of an IBM 029 keypunch. "Numeric" key is in the lower left. Strangely, this keyboard labels most special characters with the holes that are punched (e.g. 12-8-6) rather than the character. Compare with the photo of a different 029 keyboard later. A couple weeks ago, I was using the 029 keypunch in the Computer History Museum's 1401 demo room and I found that numbers weren't punching correctly. The keyboard has a "Numeric" key that you press to punch a number or special character. (Unlike modern keyboards with a row of numbers at the top, numbers on the 029 keyboard share keys with letters.) When I tried to type a number, I got the corresponding letter; the keypunch was ignoring the "Numeric" key. The same happened with special characters that required "Numeric". Frank King, an expert on repairing vintage IBM computers, showed me how to fix the keyboard. The first step was to remove the keyboard from the desk. This was surprisingly easy—you just rotate the keyboard clockwise and lift it up. The keyboard of an IBM 029 keypunch can be removed from the desk simply by rotating and lifting. On the underside of the keyboard are several microswitches for some special function keys. The microswitches are on the left half, connected by blue wires. Also note the metal rectangles along the right; these are the "latch contacts", one for each key and will be discussed later. 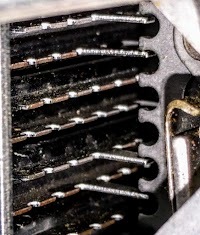 The underside of the IBM 029 keypunch's keyboard. Frank noticed that the keystem for the "Numeric" key wasn't pressing the microswitch, but was out of alignment and missing the microswitch's lever entirely. Thus, pressing the "Numeric" key had no effect and the wrong character was getting punched. He simply rotated the microswitch slightly so it was back into alignment with the keystem, fixing the problem. We placed the keyboard back into the desk and the keypunch was back in business. 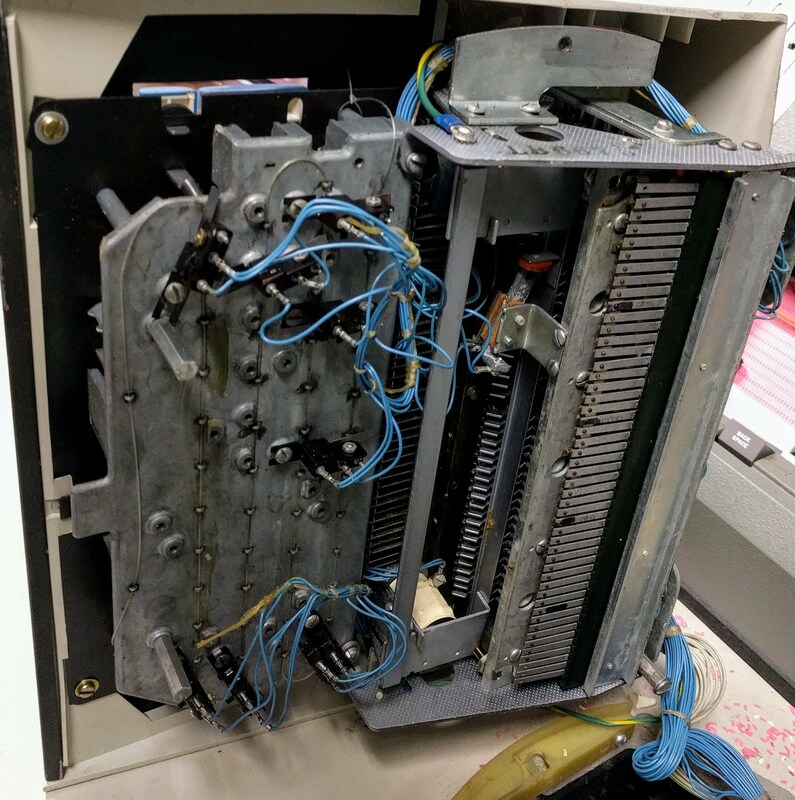 Many vintage computer repairs are difficult, but this one was quick and easy. This repair was a good opportunity to look inside the keyboard and study the interesting techniques it uses to encode characters. On a punch card, each character is indicated by the holes punched in one of the card's 80 columns, as shown below. The digits 0 through 9 simply result in a punch in row 0 through 9. Letters are indicated by a punch in digit rows 1 through 9 combined with a punch in one of the top three rows (the "zone" rows1). Special characters usually use three punches. Since each character can have punches in any of 12 rows, you can think of cards as using a (mostly-sparse) 12-bit encoding. An 80-column punch card stores one character in each column. The pattern of holes in the column indicates the character. From the 029 Reference Manual. Since each key on the keyboard has one character in alpha mode and another character in numeric mode, the keypunch must somehow determine the hole pattern for each character. With modern technology, you could simply use a tiny ROM to hold a 12-bit row value for the "alpha" mode and a second 12-bit value for the "numeric" mode. (Or use a keyboard encoding chip, digital logic, a microcontroller, etc.) But back in the keypunch era, ROMs weren't available. Instead, the keypunch uses a complex but clever mechanical technique to assign a hole pattern to each character. IBM 026 keypunch. Photo by Paul Sullivan (CC BY-ND 2.0). Before explaining how the 029 keypunch encodes characters, I'll discuss the earlier and simpler IBM 026 keypunch, which was introduced in July 1949. The 026 used the technology of the 1940s: vacuum tubes and electromechanical relays. Encoding the hole pattern with tubes or relays would be bulky and expensive. Instead, the keypunch used a mechanical encoder with metal tabs to indicate where to punch holes. The keyboard mechanism in the 026/029 keypunch. Pressing a key pulls the latch pull-bar. This causes the permutation bar to drop slightly. If a bail has a matching tab, the permutation bar will move the bail, closing the contact. The permutation bar also closes the key's latch contact. Based on the Maintenance Manual. 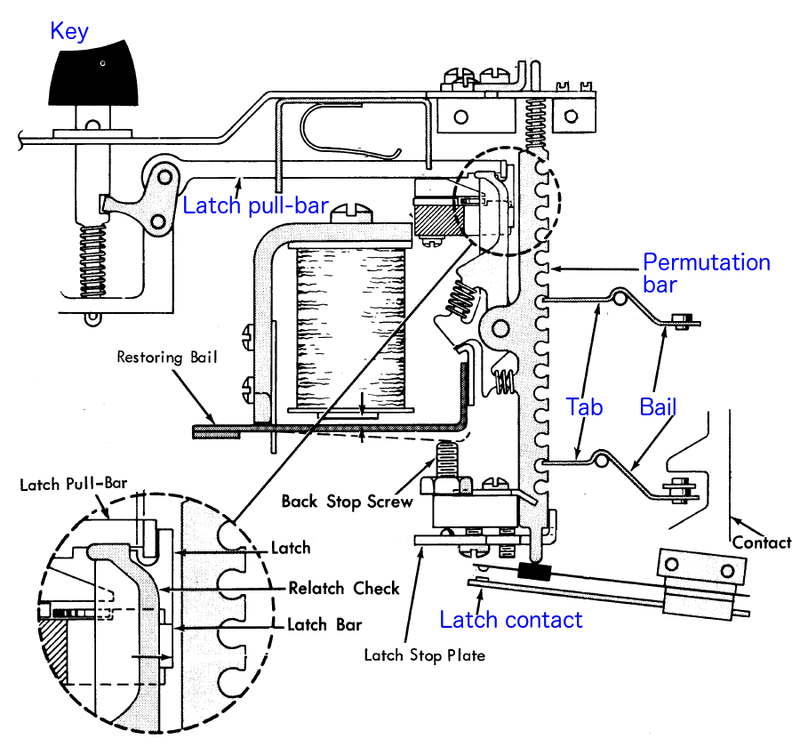 The diagram above shows the keyboard mechanism in the keypunch. 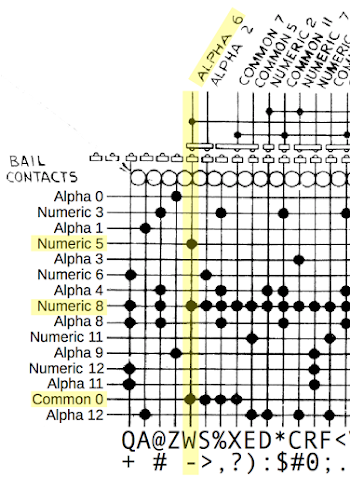 The basic idea is there are 12 "bail contacts" (one for each row on the card); when you press a key, the appropriate contacts are closed to punch holes in the desired rows. To implement this, each key was connected to a separate vertical "permutation bar" by a "latch pull-bar". When a key is pressed, the associated permutation bar drops down. Twelve horizontal bars, called "bails",2 ran perpendicular to the permutation bars, one bail for each row on the card. At each point where a bail crossed a key's permutation bar, the bail could have a protruding tab that meshes with the permutation bar. Pressing a key would cause the permutation bar to push the tab and rotate the bail, closing the bail contact and punching a hole in that row. Thus, the 12 bails mechanically encoded the mapping from keys to holes by the presence or absence of metal tabs along their length. Closeup of the bails and one of the permutation bars. Four of the bails have tabs and will be triggered by the permutation bar. The photo above shows a permutation bar (right) engaging four tabs on the bails (left). 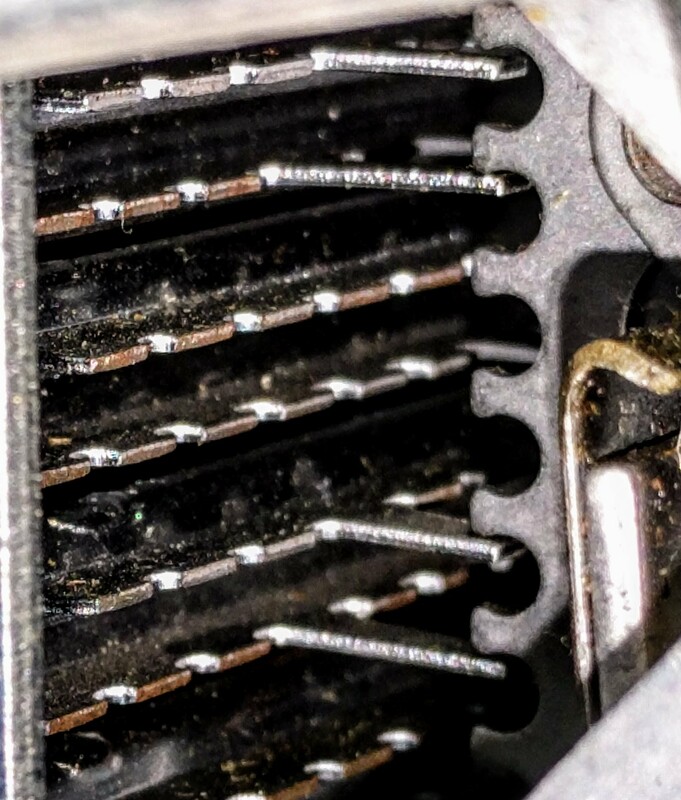 In the photo below, you can see one of the bails removed from the keyboard mechanism. Note the tabs extending from the bail to engage with the permutation bars. Also note the contact on the left end of the bail. The keyboard mechanism in the 029 keypunch. From the Maintenance Manual. There is a problem with this 12-bail mechanism: it only handles a single character per key, so it doesn't handle numbers. (The keyboard diagram below shows how numbers share keys with letters.) The obvious solution is to add 12 more bails for the second character on a key, but this would double the cost of the mechanism. However, since numbers are indicated by a single punch in a column, a shortcut is possible: use a switch on each number key to punch that row. 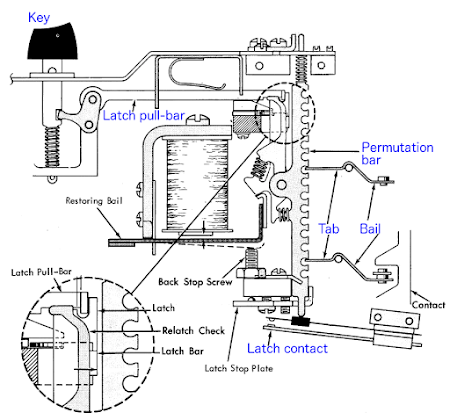 The 026 keypunch does this, using the latch contacts shown in the earlier diagram. In numeric mode, the latch contact for the "1" key would punch row 1, and so forth for the other numbers. To handle the special characters, three additional bails were added, bringing the total number of bails to 15.5 Thus, the 026 had 12 bails used in alpha mode, 3 bails used in numeric mode for special characters, and a latch contact for each key for numbers and special characters. Keyboard of the IBM 026 keypunch. From the IBM 24/26 Reference Manual. Keyboard from the IBM 029 keypunch. Photo by Carl Claunch. The diagram below shows part of the encoding mechanism, based on the keypunch schematics.8 Horizontal lines correspond to the 15 bails; the labels on the left show the row handled by each bail. Each vertical line represents the permutation bar for a key; the key labels are at the bottom. 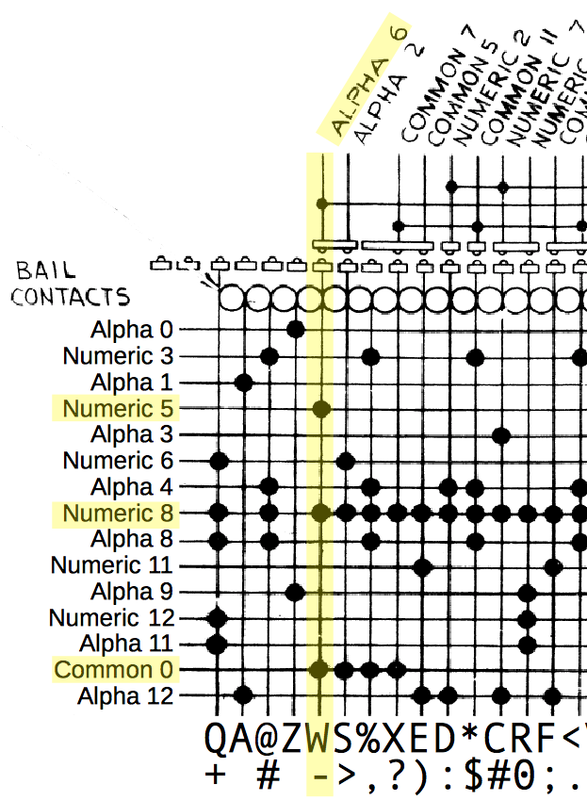 The black dots correspond to tabs on the bail, causing the bail to tripped when activated by the corresponding key. (The circles symbolize the interlock disks that keep two keys from being used simultaneously.3) Note that the 029's bails don't handle all the rows for alpha mode (unlike the 026), leaving some alpha holes to be punched by the latch contacts. Diagram showing how keys select holes to be punched on the 029 keypunch. The complete diagram is in the schematic. The yellow highlights on the digram show what happens for the "W _" key. Pressing this key (bottom) will activate the "Numeric 5", "Numeric 8" and "Common 0" bails (left). In addition, the latch contact will activate "Alpha 6" (top). Putting this together, in alpha mode, rows 0 and 6 will be punched and in numeric mode, rows 0, 8 and 5 will be punched. These are the codes for "W" and "_" respectively, so the right holes get punched. The encoder works similarly for other keys, punching the appropriate holes in alpha and numeric modes. Thus, the 029 managed to extend the 026's character set with many new special characters, without requiring a redesign of the mechanical encoder. An IBM 029 keypunch in the middle of punching cards. In 1964 IBM introduced the IBM 360 line of computers. 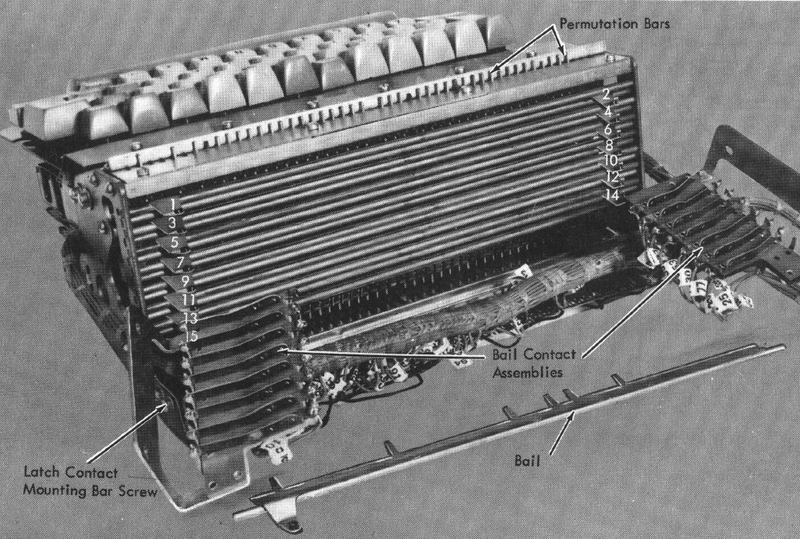 They were built from hybrid SLT (Solid Logic Technology) modules, an alternative to integrated circuits. Although the IBM 029 keypunch was introduced along with the SLT-based IBM 360, the keypunch used older transistorized SMS boards. Even though the 029 got rid of the 026's vacuum tubes, it was still a generation behind in technology. It wasn't until the 129 keypunch was announced in 1971 (along with the 370 computer line) that keypunches moved to SLT technology. If I remember my EBCDIC and some IBM 1130 I/O module stuff correctly, the punch card codes were sparse over the interval 0-7, that is, only one hole would appear in those rows. That meant you could encode a punch card code in seven bits, one bit each for rows 12, 11, 8 and 9 and a three bit code indicating a hole in rows 0-7. An awful lot of IBM 1130 I/O programming consisted of converting character codes to and from EBCDIC, IBM's alternative to ASCII. The punch card system used a special device oriented code with seven bits. The golf ball typewriter used a pivot and tilt code which indicated how the IBM Selectric type element should be oriented for the strike. The IBM 1132 printer was even weirder since it involved providing a series of bit maps indicating which pins to strike as the print cylinder rotated. It makes me really appreciate ASCII and UNICODE with all their flaws. Thanks for the info Kaleberg. One comment: punches are only sparse over rows 1-7, since a 0 punch is used for letters S-Z. I'm so glad for modern development environments. No shelf's full of 'cards needed, now all the code I ever wrote could fit on a tiny flash drive! Thanks for your detailed explanation though. 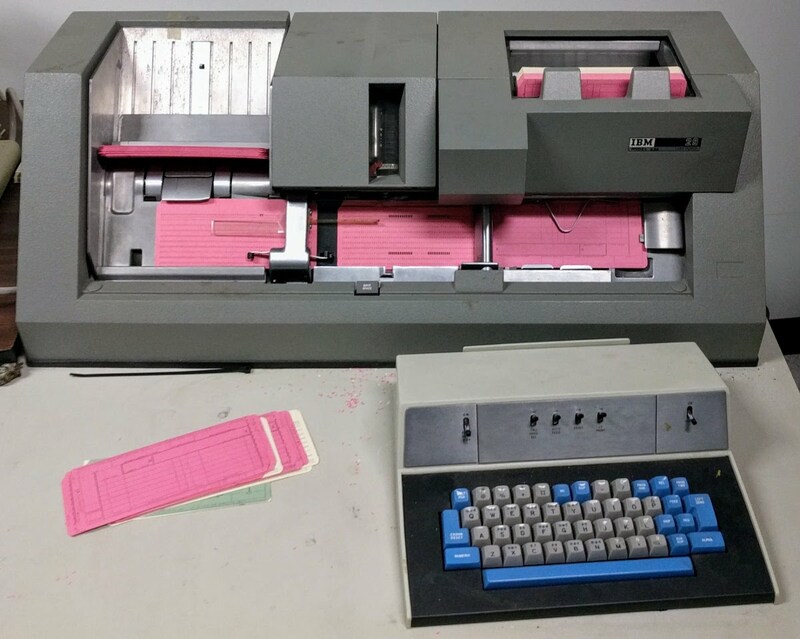 A machine like a card punch would seem to be very simple compared to an entire 1960s era computing facility, however this shows that these digital monsters required complex mechanical machinery to function. Ha! I remember using the 026 keypunch in the museum! Surprisingly nice UI, although it was a bit loud. I worked at an insurance company where I devised a method to store three digits per column (three groups of four rows of bits). We were able to store up to 240 digits in one 80-column Hollerith card. This was in the seventies, so the cards looked like lace doilies (7 = 0111). Thanks Ken! Fantastic article as usual. I had been wondering how the hell they came up with that very contrived scheme when I had to repair a similar keyboard failure on my 029 (it punched 5's when I just pressed the numeric key). You can see a video of the inside of the keyboard - and me wondering why oh why - here: https://youtu.be/FkM_FRXNXqU . It's titled "Insanely Complicated Keyboard", for good reason. Now I can sleep better, I finally know where this insanity comes from. Congrats YM from Jagodina, Serbia. MX, HNY. As programmers keypunching our programs on cards, we discovered you could "insert" or "delete" a column by pressing firmly on one of the cards when duplicating statements. For example, when duplicating a source card to a target card, press hard on the source card while typing the inserted character on the keyboard. The target card advances a column, the source card stays still. To delete, press hard on the target card, and advance the source card one column. Started working for IBM in December 1973. First machines trained on were 024, 026, 029, 059, 129 keypunches. The days of rooms full of keypunches had past but there were some companies with 10 - 15 machines. Of course every computer room had one. Married an operator.